ASC Chair, Clare Petre is delighted to announce the appointment of Associate Professor Munjed Al Muderis as its Patron. 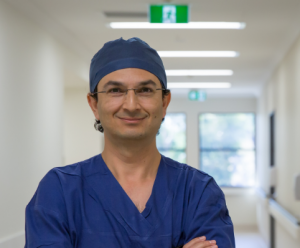 Born in Baghdad, Munjed Al Muderis fled Iraq at the age of 27 when as a young doctor he refused the orders of Saddam Hussein to mutilate the ears of army deserters. He hid – knowing that if they found him he would almost certainly be taken away and shot. After enduring a life threatening journey to Australia, he arrived by boat at Christmas Island and then spent 10 months in Curtin Detention Centre. Munjed is a pioneer in developing bionic and robotic technology, restoring mobility for amputees around the world – giving them the opportunity to walk again. One of his goals is to “leave something behind the world can benefit from”. “I am honoured to be a Patron of the Asylum Seekers Centre as its mission to recognise humanity for those who are seeking safety in Australia is very close to my heart.